WE ALL KNOW this scenario: you have been called to a meeting and now you sit there, increasingly bored as the discussion wanders all over the place, becomes sidetracked and dominated by the loud and verbose. When it is time to make a decision you find that nobody is ready because the wayward discussion has confused and obfuscated the question and there is too little information. Sound familiar? We’ve all been to unfocused, time wasting meetings like this. But — it doesn’t have to be this way. 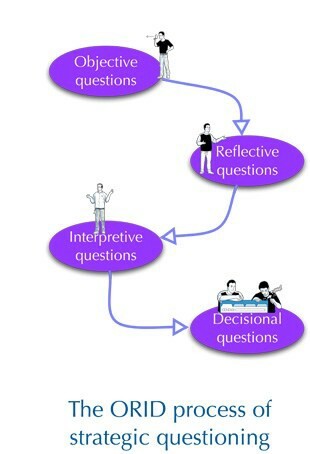 The ORID (Objective, Reflective, Interpretive, Decisional) method of strategic questioning is a structured conversation, led by a facilitator, that moves towards a decision. The method was developed by the Institute for Cultural Affairs as a means to analyse facts and feelings, to ask about implications and to make decisions intelligently. It is a means of escaping the morass of maniacal meetings. When done by a facilitator with experience in the use of the method, participants are often unaware that they are taking part in a structured conversation. It is as if someone has sat down with the group and started an informal discussion. journalists, who might use ORID to structure in-depth and investigatory interviews. A meeting that employs ORID is the antithesis of the rambling, unfocused structure we are all too-used to. ORID creates a dynamic forward movement towards a point of decision. First, the meeting agrees to make use of ORID and to abide by the process. It appoints a facilitator with experience in using the method. The meeting agrees that the facilitator can call the meeting back to order when participants wander off-track. The facilitator takes the group through a series of questions which lead to a decision-making stage. For each of the questions, a scribe writes the main points on a whiteboard. The O questions identify objective facts relevant to the topic. The key question is: What do we know about this? If it is an event or occurrence that is he subject of the ORID process, the group recalls the event and distills facts from it. The facilitator will have to be alert to pull people back from discussing what they think about the topic and their feelings about it at this stage. That comes next. All we want now are the facts. Beware of comments starting with ‘I think… ‘, ‘I feel…’, ‘’It’s my opinion… ‘. They are about perception and what the person thinks is true. They are not necessarily objective information. Comment starting with ‘I saw’, ‘I heard’ , ‘I know… ‘, ‘There is evidence for… ‘, ‘It’s on the record that…’ and so on are what we want because they are about actuality and fact. The responses to the objective questions are documented but not analysed. The R questions ask about how people feel about the topic. They are about subjective perceptions. The key question is: How do we feel about this? Feelings might be positive, negative or apprehensive and might be emotional. The R questions allow participants to express their gut feelings although these might have no objective facts to support them. Nonetheless, they are part of a comprehensive assessment of the topic in question and should not be ignored. Fears and concerns may come to the surface during this phase. The phase is one of identifying feelings and not of analysing them. The I questions are to do with meaning. The key question of the interpretive stage is this: what does it mean for me/you/the organisation etc? Basing discussion on information derived during the objective and reflective questioning, the discussion allows the topic to be put into perspective and for the potential impacts of the topic on the individual or organisation to be explored. Interpretive questions might include ‘What if…?’ questions as well as ‘What would it mean… ?’, ‘What would that do… ?’ and so on. This is the analyitical phase. Based on information coming from the three previous stages of questioning, the D questions lead to a decision. The key question at the decisional stage is: What are we going to do? The facilitator might set the set scene for this critical question by recapping the findings of the previous three stages. The focus of discussion in the decisional stage is the future. What would be the best course of action? What would be achievable, positive outcomes? What is realistic given the limitation of our resources? In all four sages, the phrasing of the questions and statements by the facilitator are critical to maintaining a focused discussion. It is important to set aside sufficient, uninterrupted time for the ORID process. Rushed conversations and frequent interruptions are distracting and cut off important discussion. There is no fixed time over which to run an ORID process. It can be short providing there is enough time to adequately cover all of the questions. Facilitators and educators planning to make use of the ORID technique are advised to practice it with people they know before launching into an important decision making process.